Hi there! My name is Matt Maloney, and I work as a Naturalist Guide at the AMC’s Pinkham Notch Visitor Center. I lead twice daily natural history walks as well as make recommendations to people looking for a nice walk or a destination to seek out. 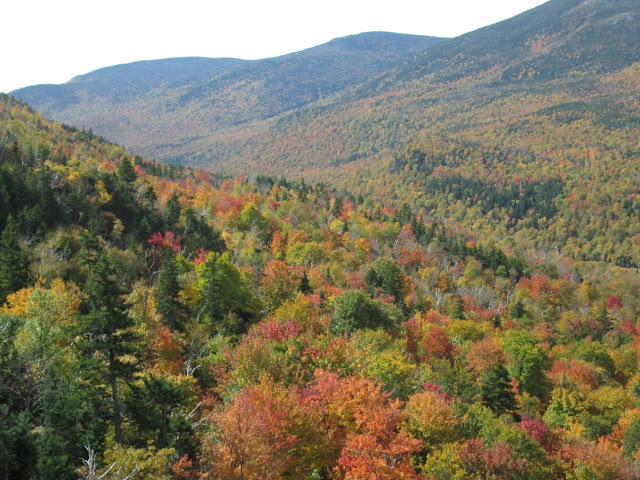 Right now the peak of fall foliage is upon us! 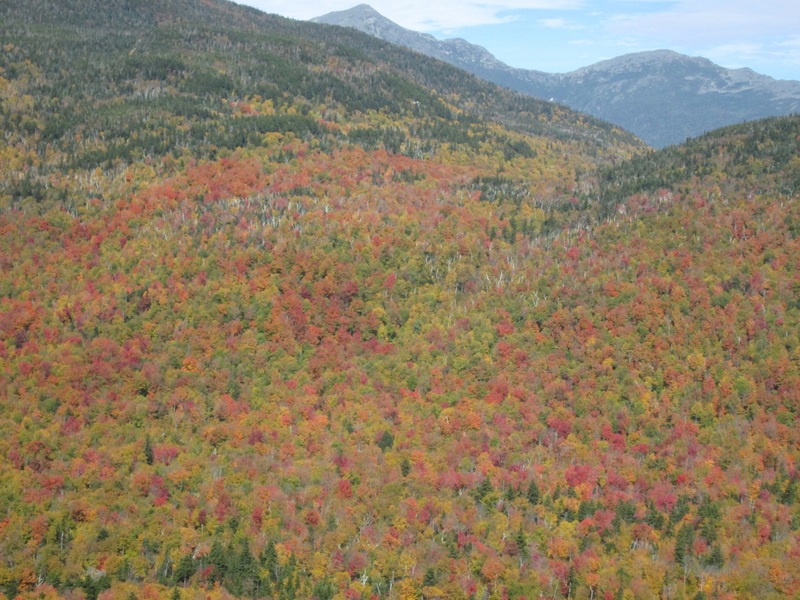 Over the last few days the colors have been reaching perfection at elevations above 2,000 feet, including here in Pinkham Notch, New Hampshire. After several days of rain, the sun is currently shining and opportunities to take in the foliage at Pinkham Notch abound. The best way to take in the scenery is to throw on a pair of hiking boots and head out onto one of the many trails that originate from the Notch. 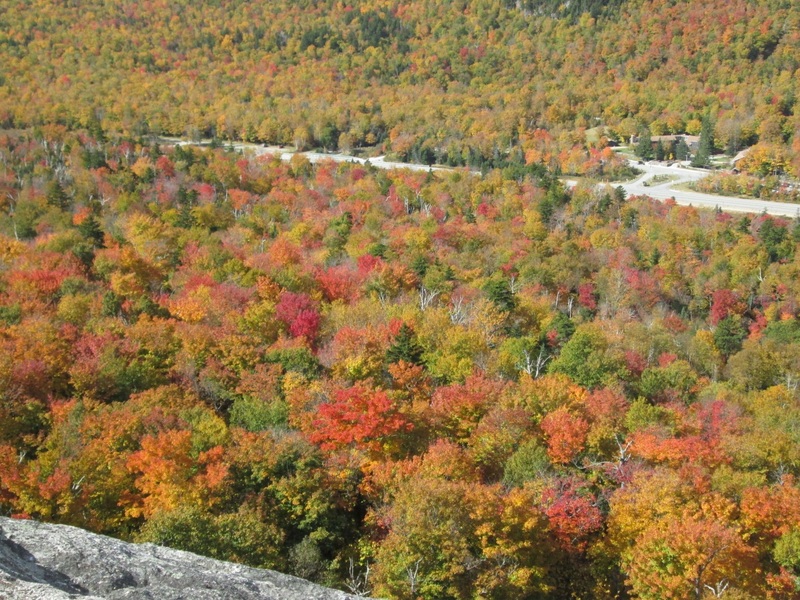 At this time of year one of the best places to view the reds, yellows, and oranges of changing foliage is from atop Square Ledge. 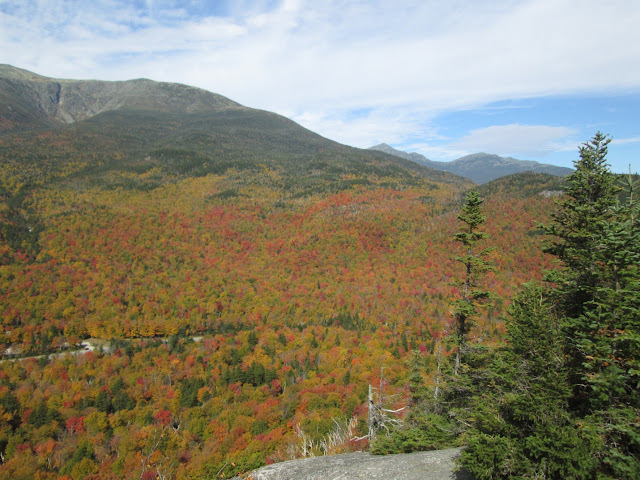 Square Ledge is a choice hiking destination because it offers a short one-mile round-trip hike to a massive ledge, where you can scan views in all directions of the beautiful fall canopy, as well as take in a splendid view of Tuckerman and Huntington Ravines below Mt. Washington. The trail starts directly across the street from the Pinkham Notch Visitor Center and can be tied in with a half-mile side trip to Lost Pond, a lovely hike that features a walk alongside the Cutler River through spruce and balsam forests. The AMC offers guided hikes every day from the Visitor Center to locations such as Square Ledge and Lost Pond in order to introduce people to the natural history of the White Mountain landscape. This time of year, I also give people a lot of background on the science and mystery of leaf change as part of my walks. Walks start at 10 a.m. and 1p.m. and are free. So come to Pinkham if you have the chance and view the splendid colors before they disappear. This is one of the best times of year to experience the sights and smells of the mountains, but it is fleeting. 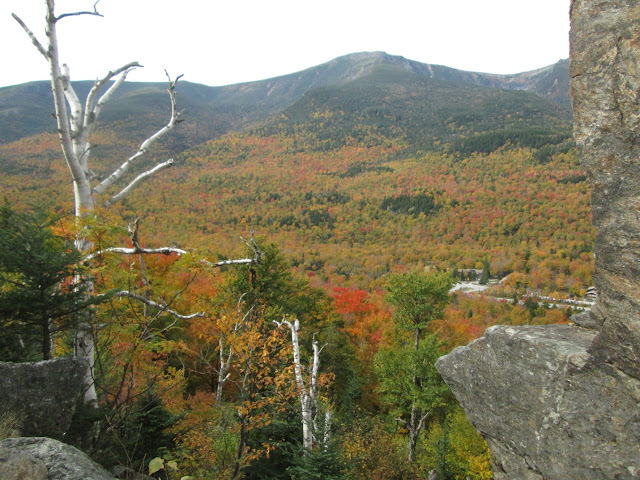 All photos were taken 10/2/12 from Square Ledge.